The ambitious 6.4 Acre, 400 Apartment Township project, promoted by CEWS Society formed by a group of IT employees from Hyderabad and abroad has moved into construction phase. Nagarjuna Construction Company (NCC) who is the turnkey contractor for the project has initiated site mobilization and construction activities. The project is spread of 6.4 Acres of flat land, surrounded by greenery except on the northern side where Aparna Group is preparing to launch a township. The Project site is close to Tellpaur HUDA Township. The recently announced Tishman Speyer 100 Acre Township is 1.75km from the CEWS Project. The Project is ideally suited for people working in Gachibowli Financial District and Hitec City areas. The project was recently approved by HMDA and CEWS is said to be one of the few projects which went ahead and paid the large Approval Fees to HMDA, thus helping the Govt. to get some cash flow during these lean times! “Each flat comes with 2 covered cellar car parks. The project has the largest Indoor Swimming Pool in Hyderabad. It has two Tennis Courts, Basket Ball court, Two Indoor Shuttle Courts, AC Gym, Library, Restaurant, Creche and other amenities including Landscaped Gardens and Children’s Play areas” added Mr. Ram Kumar. “With its impressive 35000sft Club House, CEWS provides the largest club space per family of ~90sft which is more than double the space provided by any other integrated township in Hyderabad” Said Mr. Ram Kumar. 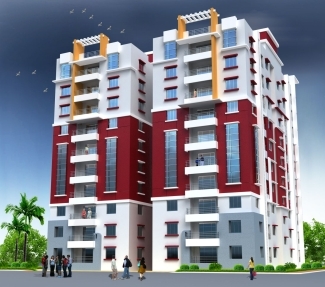 The project architecture is by Akshaya Architects one of the largest Architectural Design firms in Hyderabad. The project promises to be a harmonious island of luxury, in the green Western suburbs of Hyderabad. With Tishman Speyer township coming up at Tellapur, this locality is poised to become an up market residential zone which would supports the commercial expansion of Gachibowli and Hitec city.